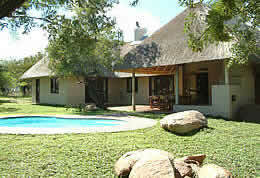 African Bush accommodation in the city - a place with unrivalled beauty, serenity and tranquility. Enjoy superb accommodation and service, conferencing with a difference and fine dining. Leriba Lodge - the African word from the Sotho language meaning "place on the river bank". 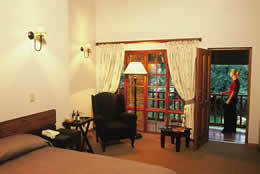 Situated on the banks of the Hennops River near the R28 linking Pretoria & Johannesburg. All major credit cards are welcome. We offer reduced rates for longer stays and groups of ten or more people and free transfers to Centurion shopping centre. Groups and Tour Leaders or Guides are invited to enquire about our special rates and packages. Special weekend and school holidays rates available on request. Late arrival and early check-out by prior arrangement. Room will be released at 18:00 without prior arrangements for late arrival. Transfers to and from Johannesburg International Airport, Pretoria, Midrand & Johannesburg by prior arrangement. -Birding or fishing in the Hennops River. -Horse riding at the horse riding school,are a few minutes away. Leriba Lodge, 4 star graded hotel, boasts 60 luxury en-suite rooms and 12 well equipped conference venues that can accommodate up to 700 delegates per day, and an award winning a la carte restaurant that serves delicious cosmopolitan cuisine. A coffee shop in the foyer serves full English breakfasts, light meals and refreshments in the restaurant or on the shaded terrace bordering the large swimming pool. Apart from the large swimming pool and heated pool Leriba Lodge also offers a variety of activities such as teambuilding exercises and golf training by a PGA professional at our own golf academy.